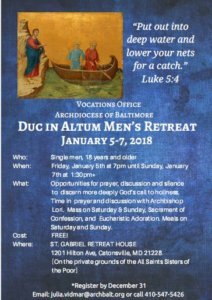 BaltimoreCatholic.com – The Baltimore young adult webpage run by the young adults themselves featuring various programs and events around the region! A Young Adult Parish Process is now available in both English and in Spanish. These are designed for all parishes who have and/or are interested in developing ministries with young adults. While prepared as a resource for the Hispanic Young Adult Strategic Plan. These resources do not make distinctions regarding ethnicity. With the support of Bishop Mitchell Rozanski, the Division of Youth and Young Adult Ministry launched the Archdiocese of Baltimore’s Hispanic Young Adult Strategic Plan. The document is in both English and Spanish and it is meant to help create a greater collaboration between young Hispanics (ages 18-35) and the Church. Featured in the Plan are recommendations of how young Hispanics can become “active agents of evangelization” in their parish communities. Catholic Culture – An interesting site created by Trinity Consulting, Inc., containing resources to help Catholics live the liturgical year at home. BustedHalo.com – A spirituality web magazine for people in their 20’s and 30’s run by the Paulist Fathers.